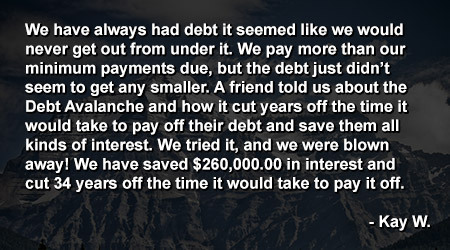 Debt Avalanche started from a simple thought...there has to be a better way. 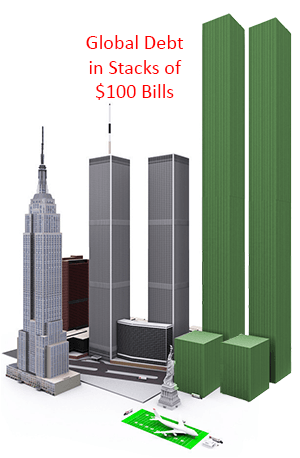 Many people believe that debt is simply a fact of life. In fact, more than 80% of Americans have it. Of course, that is also IF you only have a mortgage, cars and a credit card...no student loans, personal loans or other types of debt. And it's not just Americans with the problem. According to a 2017 study by the Institute for International Finance, global debt levels are now roughly 325% of the world's gross domestic product...$217,000,000,000,000 (yes, that's Trillion!). If you spent $100 per second, every second of every day, it would take you 68,810 years to spend $217 trillion dollars! This is ridiculous...there has to be a better way! Debt Avalanche Founder and CEO, David Hall, went on a search. Wading through hundreds of philosophies, systems, programs, books, videos, etc., what he found was there were lots of ways to get out of debt. The problem was that most of them are ineffective, inefficient or simply didn't work. Lots of things worked in theory, but when it came to practical application, most failed miserably. Simply put, more often than not, they are hard to stick to, give no easy way to handle them, offer no real way to speed up the process of getting out of debt or try to convince you that you have to "eat beans and rice" for the rest of your life until you get some breathing room. 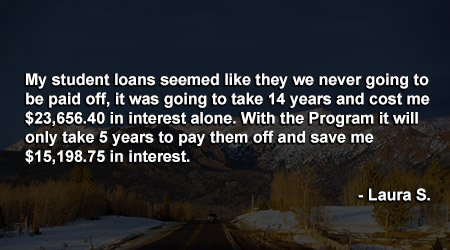 We don't believe that getting out of debt should be hard. You shouldn't have to give up everything you enjoy in life. You also shouldn't have to consult a crystal ball or some mystical oracle to try to figure out how to get it done. 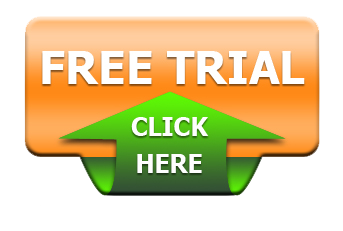 You should be able to simply enter in the numbers from the statements on your debt and be able to get a print out of the easiest, most efficient way to get out of debt. Not only that, but you should also be able to see how much money and time you will save if you maximize how you get out of debt. There should also be an easy way to figure out where to put the money when you get a few extra dollars and want to put some of it toward our debt. But it shouldn't just be about a payment plan, it should be about other things as well. Debt Avalanche is the most efficient, effective method of not only getting out of debt, but also growing your finances in all areas. 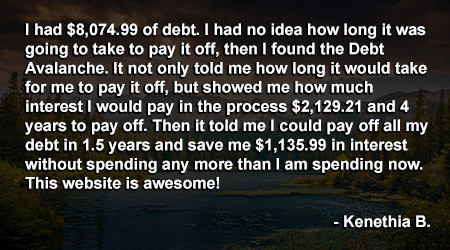 It took over 20 years of development, finding the best way to get you out of debt. Once you're out of debt, you need to know what else to do. That's why we've put together hundreds of resources to help you out. In the Debt Avalanche Resources, you'll find everything you need, not to just get life back on track, but to grow you to a whole new level. With a variety of videos, audios, downloads and more, you can hit the path to financial freedom. We've thought of that one too... We have Money Coaches available to help you every step of the way. Whether you feel like you have a unique situation and need a little help or you need some guidance and accountability, your personal Money Coach can be there with you every step of the way. Click the button below now to try out the Debt Avalanche for FREE and see how much you can save today.